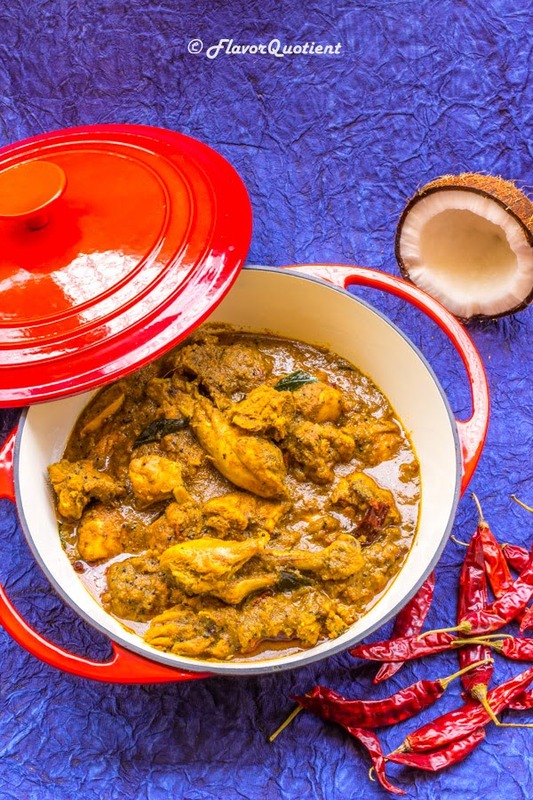 Country style chicken curry from the serene hills of Coorg in Southern India! 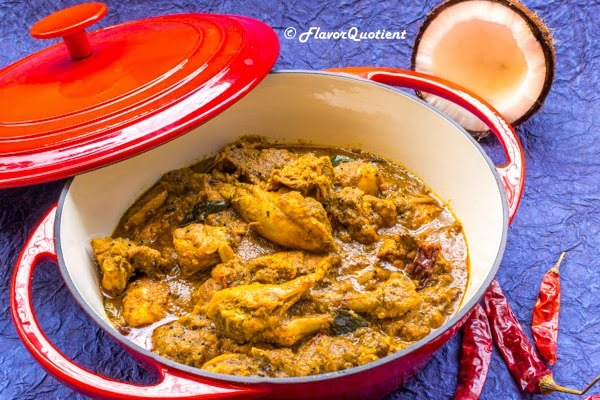 This is a very special chicken curry coming from a beautiful place of India which is known as Coorg. Coorg is a small hill-station in the southern India and a popular destination for weekend gateways. It is one of our favorite places to flee to when we want to disconnect ourselves from our regular mechanical life. The serenity of this place touches my heart every time I visit there. The greenery of the valleys is so pure that you will want to be lost in it. We have been there at least 4 times already, but every time I discover something new in this place. I should also mention about the special cuisine of Coorg and my today’s recipe is one of its very popular delicacies. It is Coorgi style country chicken curry. While talking about Coorg, it would be incomplete if I do not tell you about their rich produce of various spices. You will get all varieties of spices which are used in all authentic Indian food, but it is primarily famous for their large production black pepper, vanilla and cardamom. At the same time, Coorg has a large production of coffee. The lush valleys with coffee plantation are pure beauty to our eyes. 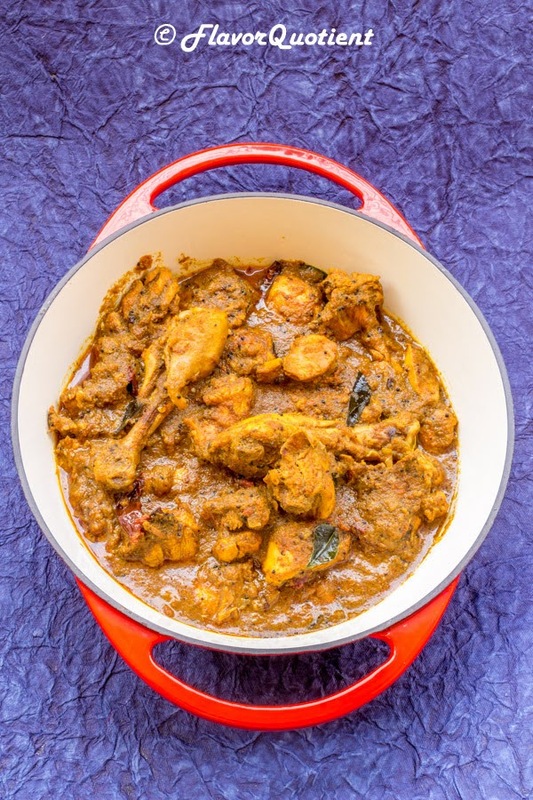 My today’s recipe is a very traditional chicken curry from Coorg and this one is made with country chicken. 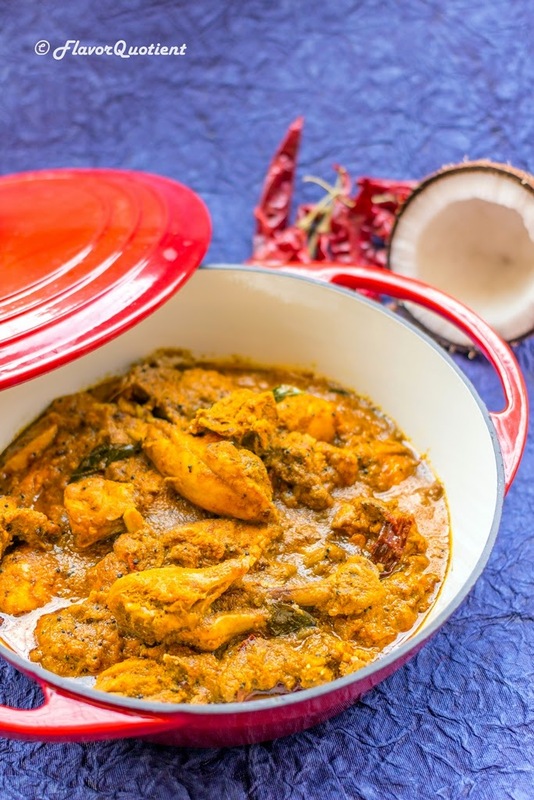 The use of grated coconut lends a very special taste to the curry sauce. I loved this dish from the very first time I had it in Coorg and was waiting to share it with you all. This is paired best with plain steamed rice as the complex rustic taste of this curry is best complemented with the plain rice. Do give this a try and let me know how you and your family liked it! First we will marinade the chicken pieces. Combine all the ingredients listed under Marinade in a small bowl and mix well. Rub this marinade into the chicken coating the pieces thoroughly. Cover with a cling film and refrigerate for an hour. Now let’s make the Coorgi spice paste. Heat a small frying pan and add all the items specified under ‘Coorgi spice paste’ and saute them till they release their aroma and start to turn rich brown. Once the coconut and other spices are lightly charred, remove them from heat and transfer it to a grinder. Add a little water to it and churn to make a smooth brown paste. Set aside. Next make the curry base. Heat a large deep pot and add vegetable oil to it. Once the oil is hot, add mustard and fenugreek seeds and saute them till they start to crackle. Now add red chilies and curry leaves. After a minute, tip in the chopped onions and fry till the onions turn golden brown. Add the Coorgi spice paste and saute it on high heat till the spice becomes dry and starts sticking to the bottom of the pan. Deglaze the pan by adding water gradually and scraping up the spices from the base of the pan by stirring continuously on high heat. When the spices become dark brown in color and oil starts to separate, add the chopped tomatoes, salt and sugar. Fry till the tomatoes are fully mixed and blended with the spice mixture. Add the tamarind paste and saute for a minute to mix it well. Take the chicken out from the refrigerator and season well with salt. Now add the chicken to the spice mixture and stir thoroughly on high heat. The spices should coat the chicken well. Fry the chicken on medium heat for 10 minutes till they are deep brown and lightly charred all over. This sautéing is important as the spices impart their flavor to the chicken during this process. Now add enough water to the pan to cover the chicken and give a good stir. Bring the curry to a boil and then cover and cook on low heat till the chicken is thoroughly cooked. Keep checking in between so that the chicken is not over cooked – it should be perfectly tender and the gravy should be medium thick. Once the chicken is done, uncover the pan and boil off some liquid from the gravy if it is too thin. Give a few good stir to mix everything well. Now take another small frying pan and heat oil in it for tempering. Add the tempering ingredients and fry them for a minute till they turn dark and become aromatic. Pour the tempering over the simmering curry. Stir it in and turn off the heat. Do a final test taste and adjust seasoning if necessary. You are done!